The reader may no doubt have noticed some rather peculiar job titles in the Mindfindr occupation lists. So let us look into the job of the astrologist and some of the competencies crucial in that line of work. Astrologists and fortune tellers are taking their prominent place in the Finnish media thanks to the increased supply of low-cost media time especially on commercial TV channels. As such these personal services have been in demand for ages and ages, since people have always sought to understand, predict, and control their lives. In this sense, these services have similar functions to those of, say for example, pastoral care or therapy. People choose among these and other services based on their own needs and world views. In the International Standard Classification of Occupations (ISCO) astrologists or fortune tellers are placed in the category of other personal service workers, in the group 516. Astrologists and fortune tellers (ISCO 5161) tell people about their past and predict their future by creating various astral charts and models based on e.g. birthdays, or telling about the future by inspecting the client’s palm, using cards or by other methods. The picture shows that people who might be active in the astrology business could often choose to function as office clerks, hotel receptionists or travel agents if they complete or intend to acquire at least vocational training. On the other hand, the competence potential useful and to an extent important in all these occupations and jobs could be utilized professionally to qualify e.g. as a language teacher, this requiring taking at least a Master's degree. Further some persons with these strengths may end up in the roles of an information officer or an HR Assistant should they chose to go through a tertiary level vocational training. Thus, it is noted that people who enjoy having lots of personal contacts and interaction or want to help others may put these preferences to profitable professional use in the market. Likewise, all of the above jobs require a certain inclination to fluent speech and an ease of verbal communication. 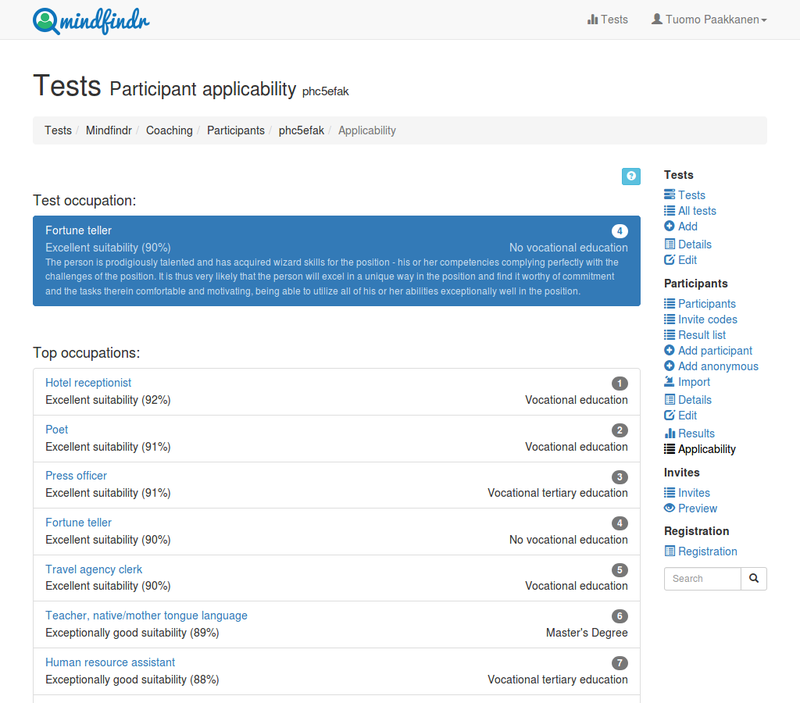 The list of occupations in Mindfindr is quite comprehensive and the user organization may acquire assessments of test-takers for all the listed professions and occupations. 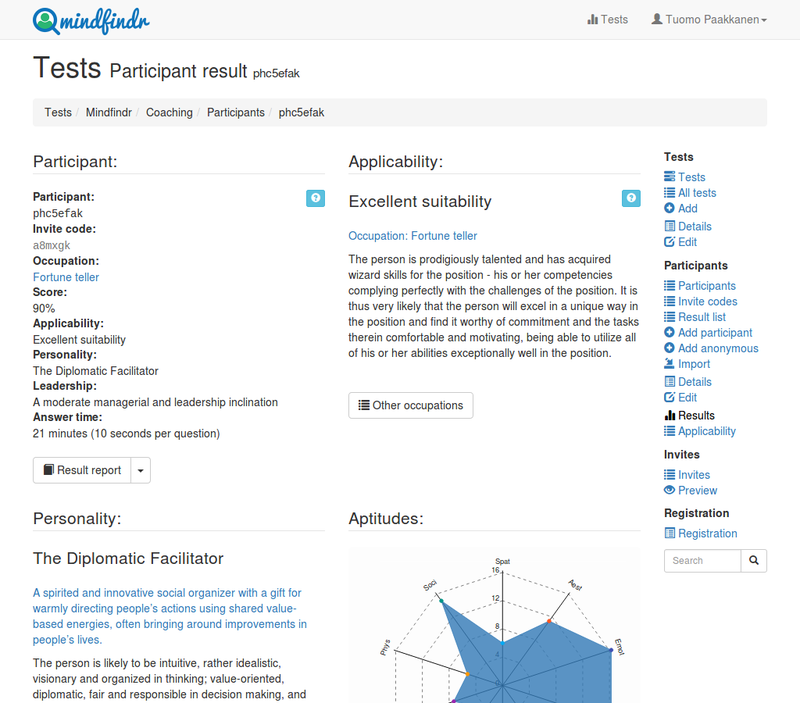 However, since Mindfindr service does not inquire about and gather information on respondents’ background (like SES), the produced lists for a given respondent may include positions and professions that are irrelevant or outright impossible for the person due to age, basic training or the life situation. Hence in terms of education levels and other considerations any results should be put into their interpretational context by the user. This should preferably be done together with the testee when e.g. looking to relocate the person. This is even more important when doing career planning with the assessed person.